The European festival season has just ground depressingly to a halt to make way for a few months of Netflix and chilly. That means it’s time to look back longingly at the photos from those four days of music and sunshine you’ll use to define 2017 in any social media end-of-year round-up. If you were at La Route Du Rock in St Malo, you’ve already won the shallow one-upmanship battle, because there’s no finer combination of seaside bliss, historic charm, epic scenery and perfectly curated festival lineup in your friends’ feeds. But this festival isn’t simply style over substance. With a year-round role booking French tours for international artists, the team behind La Route du Rock are in a prime position to book one of the most eclectic and solid live bills of them all – this year as ever. PJ Harvey is at her witchy best, floating around the stage as the sun disappears (possibly her doing), turning the stageside screens black and white in the process. At the other end of the scale entirely, Mac DeMarco swigs hard liquor and plays to a table onstage he’s filled with his friends – although we’re all his friends by the time he’s done shambolically charming the crowd. Interpol are technically on point, if a little absent, which is disappointing. But Future Islands make up for it with the set of the weekend, Sam bouncing and sliding around the stage – sometimes on purpose, sometimes not – and singing his heart out like it’s their last gig, as always. Because the music starts at 6pm, it goes on until the crack of dawn. That’s when the DJs come out to play. Helena Hauff’s techo is, as it turns out, perfect late night fortress music for anyone carrying on until 4am. But for those who like to get even a vague nod towards a tan and an encounter with the real St Malo, the beach stage is a short bus ride away. This is where Kaitlyn Aurelia Smith’s beautiful nature-inspired synth strangeness is the fitting soundtrack to people throwing themselves off a diving board into the sea. 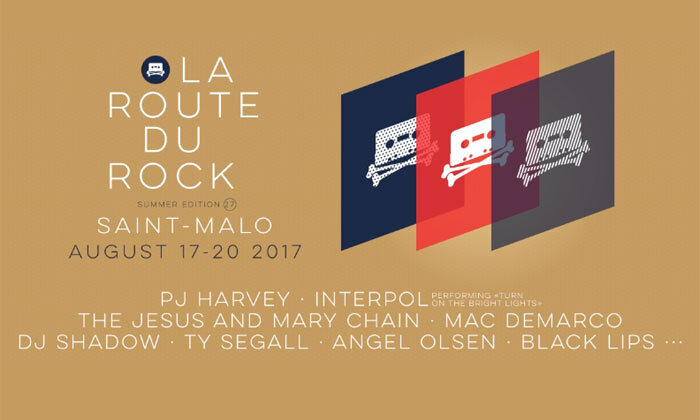 La Route du Rock has been slowly catching more and more Brits in its net over the past 26 years, and keeping them loyal. It’s easy to see why. The festival combines a laidback holiday in a stunning city with some of the biggest names in alternative and indie music, plus it’s not particularly child friendly – make of that what you will. It’s not all relaxing escapism, sadly. In these troubled times, no major event in Europe goes unpatrolled. Even though the festival takes place in what was once a working fortress, it’s still initially alarming to catch a glimpse of the troop of armed guards patrolling the border. But fair play to the PR department, because they seem to have been selected for their perfectly symmetrical Instagram-ready faces. What I’m saying is that – for various reasons – the military presence is not that scary, so don’t let it put you off coming next year.